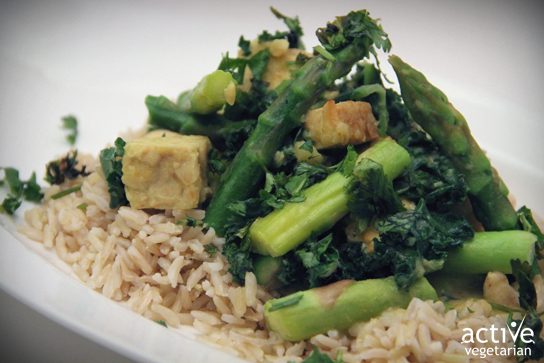 This Vegan Coconut curry is not only a super flavorful dish, but it’s also easy to make and healthy for you! Let’s examine the health benefits of curry, shell we? Turmeric is the primary spice in curries – it’s how you get that beautiful yellow when you’re making a curry. Many medicinal properties have been associated with it and many in South Asia use it as a readily available antiseptic for cuts, burns and bruises. It is also used as an antibacterial agent. Ginger has fantastic antibacterial powers and is a great natural remedy for sore throats.It also acts as an excellent digestive aid by helping to relive indigestion, gas pains, diarrhea and stomach cramps. Garlic has antibacterial properties and can kill off those annoying bugs and germs that can cause colds and sore throats. This potent herb is also renowned for lowering cholesterol and possibly slowing the growth of cancer cells. We all know that eating Chili is great for clearing out the nasal passages and destroying the last vestiges of a cold, and it makes you sweat as well! It is believed that eating chili increases your metabolism, and a higher metabolism means you burn calories at a faster rate. Combine the shallots, ,chile, ginger, salt and garlic in a food processor and pulse until a smooth paste forms. In a large pot, heat oil over medium heat. Add the shallot paste, and cook for 5 minutes, or until starting to brown. Stir in the curry powder, tumeric, sweet potatoes, coconut milk, and 1 1/2 cups water. Bring to a boil then reduce heat to medium-low and simmer for 10 minutes. 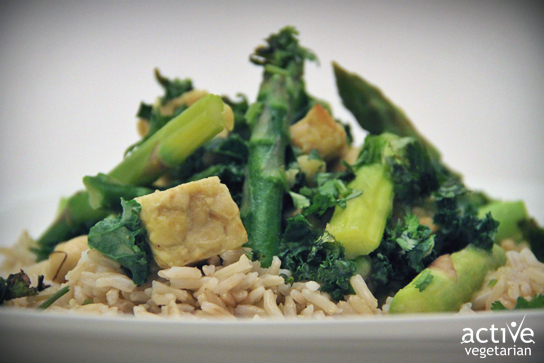 Add the asparagus,kale and tempeh; cook for 5-8 minutes or until asparagus is tender.